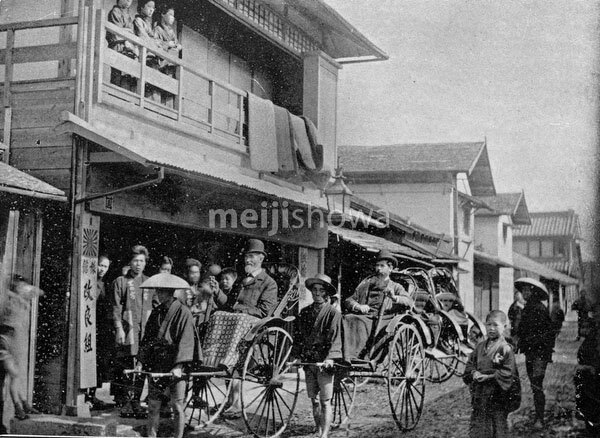 Bishop Escher of Chicago (left) and German-American missionary F. W. Vögelein pose in rickshaws in front of a Japanese ryokan (hostel) in June 1893 (Meiji 26). Such hostels served simple Japanese food and offered only Japanese accommodations, forcing Westerners to eat and sleep on the floor, something that many found difficult to get used to. There was also little to no privacy as rooms were separated by thin paper sliding doors and foreigners created much curiosity.